1. Create a Profile. Go to www.healthyeatingmn.org. On the left side of the screen is a box asking you to sign up. Click on it, answer the questions, and create your profile. Having a profile lets you take part in the best parts of the network—asking questions, commenting on posts, building networks, and more. 2. Join a Community. Communities are places to ask questions, seek feedback, and connect with other Minnesotans who care about healthier food systems. Right now, the network features communities focused on healthy kids, urban agriculture, food policy, food justice, and farmers markets —all convened by your friends and colleagues. Join a community, or feel free to create your own! 3. Share Your Content. Have an event you’d like to publicize? Want to share a great news story? What about some pictures from your urban farm, community garden, or healthy food-related event? Share your content, and build the network! 4. Spread the Word. Invite your friends and colleagues to join the network! Send an email, share a link to the Facebook page, and post to listservs. The more the merrier! The Healthy Eating Minnesota Network features original writing from network members, links to case studies and resources, and event listings from across the state. We’re excited to launch the network, and look forward to our shared work to grow it with your feedback and collaboration. The Healthy Eating Minnesota Network is funded by Created by Blue Cross and Blue Shield of Minnesota to support networking, collaboration, and discussion that will increase access to healthy foods for all Minnesotans. Blue Cross and Blue Shield of Minnesota is a nonprofit independent licensee of the Blue Cross and Blue Shield Association. The purchase of a home changed my life. I never knew how much my perspective would shift after making such a large investment and commitment to something as basic as shelter. How foolish of me. Although I must admit, I always paid special attention to how our physical landscapes and environments influence our health, behavior, and our sense of “place.” When I lived in places that were dirty, dark, or cold I noticed a difference in my wellbeing. When I heard yelling from the unhappy neighbors living next door, it was tougher to have sweet dreams or to go home at all. Despite my awareness of the importance of living in a place that is safe and that reflects and expresses our true personhoods, I have often neglected taking care of my home (and therefore myself). For me, it has been easy to go on living in places filled with piles of laundry scattered here and there. It has also been easy for me to ignore dirty dishes. Generally speaking, it was not a hard choice to avoid developing the spaces I inhabited. That choice wasn’t the fault of my loud neighbor or a landlord’s requirement. It was my own choice. In addition to my lack of ambition, resources were often scarce. Excuses were always many. When can one find the time, the money, or both to make the repairs and enhancements necessary to make a home healthy and beautiful? What is a healthy and beautiful home, and why does it matter, anyway? Well, it turns out there are many low-cost ways that can transform a space and make you feel good about the place you call home, whether you own or are just staying the night. As a renter, it’s easy to view your home as temporary, but that is not the way you have to treat your stay, and it is certainly no excuse to give up on making your home a healthy place to live. Unfortunately it took me until I actually bought a home to truly respect and honor the sense of place, security, and wellbeing that such a place provides for me. Today I want to share a simple project that is on my to-do list that will create a feel-good sensation at home. I find these wands to be the perfect project to look forward to as I wait for the cold season to make its way out of Minnesota. Traditionally, women placed these bundles of joy in drawers to keep their underclothes smelling fresh and also to repel moths. Nowadays, they would be known as drawer scenters. They make a great gift and add beauty and health to any home. 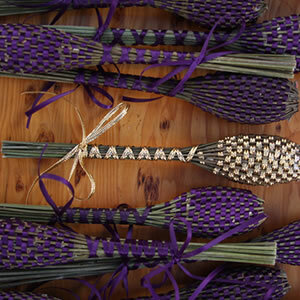 They are called, Lavender Wands. To see a more detailed step-by-step process with pictures, visit Homemade Gifts Made Easy. Have garden space where you live or have access to a community garden plot? Check out Midwest Living’s How to Grow Lavender in the Midwest. Can’t wait for fresh lavender to arrive? Check out lavender essential oils in the meantime. Put a drop on a cotton ball and sniff to your heart’s content. Although, be careful not to sniff too much, because while lavender offers relaxing properties, if used too much it will act as a stimulant.